Onlinepharmacy-24h.com was an online drugstore that focused on the delivery of generic medications which had their source in Indian Pharmaceutical companies. The store was also delivering brand medications from re-known pharmaceutical companies. The pharmacy did not indicate its physical location on its website or the year when it started its operations online. Onlinepharmacy-24h.com was carrying a huge catalog. Some of the meds I found on the pharmacy catalog include erectile dysfunction drugs, allergy medications, anti-viral drugs, arthritis meds, asthma medication, birth control, blood pressure meds, diabetes drugs, and others. I found Online Pharmacy 24h to have been very affordable. A pill of generic Viagra was being sold at a price of only $0.35. A pill of generic Cialis price was $0.77 while generic Levitra was offered at a price of only $1.15. A pill of brand Viagra was worth $3.92. When compared to the 70 dollars local pharmacies sell brand Cialis and brand Viagra, buyers were able to save approximately 95% of their money. When men wanted to pay for their ED pills, they were allowed to use two payment methods. These included credit cards and bitcoin. The credit cards accepted by Onlinepharmacy-24h.com included VISA and American Express. Paying with credit cards have the advantage of helping buyers dispute any charges made to their cards when the pharmacy fails to deliver the medications a buyer had ordered. The pharmacy had a 24/7 customer support department. I found this to have been great because their buyers could have gotten help whenever they needed it. The numbers buyers could call the pharmacy with included +1 800 715 5341 (US) and +44 203 318 5981 (EU). After paying for their medications, buyers were expecting their meds to be delivered either via the Airmail shipping or via the courier shipping. The airmail shipping took approximately 2 to 3 week before medications got delivered. The courier delivery was taking about 5 to 7 days. Online Pharmacy 24h did not indicate the money a buyer would have expected to pay for any one of these shipping methods. The processing of all orders submitted was being done by the Onlinepharmacy-24h.com staff in a period of 24 hours. Buyers could get meds from Online Pharmacy 24h without having a prescription script. The pharmacy indicated that buyers were allowed to cancel their orders before they got shipped. If the order had already been shipped, canceling as not possible. The pharmacy assured their potential customers that ordering their meds from the drugstore was safe. The drugstore had a money-back guarantee. If the pharmacy failed to deliver the medications a buyer had ordered, the pharmacy was refunding him or her. When trying to understand whether an online pharmacy is safe enough to order medications from, it is extremely important that you check its testimonials. They will give you a clear idea of what dealing with an online pharmacy will be like. The reviews you should believe should be available on a third-party review-collecting website. Most of the online pharmacies will have testimonials on their official website. These reviews are not worth trusting as they are a part of the website’s content. 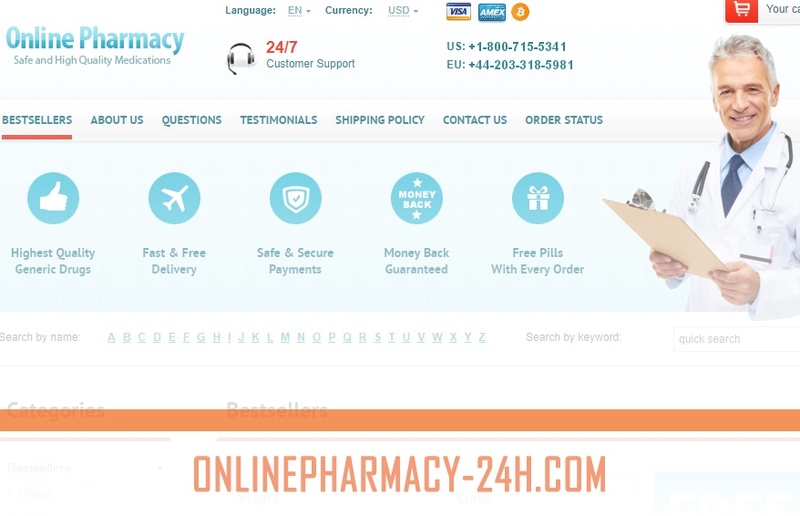 Jenny thanked Online Pharmacy 24h. She appreciated how helpful the med store had been. She indicated that she would recommend the pharmacy to anyone who asked her. Eliot Wilson got his package from Onlinepharmacy-24h.com. He had done business with Online pharmacy 24h before successfully. He had been recommending the pharmacy to people who wished to have a fair deal on their medical supplies. Eliot appeared to have been diabetic and regretted the fact That Online Pharmacy 24h did not have insulin on their catalog. I did not find any reviews written for Online Pharmacy 24h in 2018. This could be because the pharmacy has already shut down. I had to scan its domain address to see what would come up. The program I used is Scam adviser. Scam Adviser indicated that the pharmacy had a high trust rating. It had a 70% safety rating. For a normal website, this is a fair safety rating. However, for a website whose main focus is to make sure that buyers got medications and also took money online, this safety rating should be 100 %. Every order a buyer placed at Online Pharmacy 24h came accompanied with free pills. The pills added to the order were erectile dysfunction pills. That is, buyers got Viagra, Cialis, and Levitra pills for free. The drugstore had a free shipping offer. After purchasing meds worth more than $200, buyers were offered free airmail delivery. After spending $300, buyers got free express delivery. Online Pharmacy 24h had an average trust rating. This means that there is a likelihood that the drugstore was offering its customers quality services. The pharmacy lacked proven testimonials. This made it look untrustworthy. The onsite reviews on the drugstore website could have been created by the drugstore management. The pharmacy had low prices. It cost at least 95% cheaper than local pharmacies. The pharmacy had a wide catalog which made it easier to shop for meds.